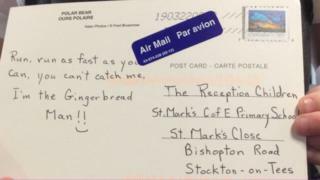 A school has received more than 500 postcards from around the world after a social media post about a gingerbread man went viral. St Mark's C of E Primary School called on people to send a card saying "run, run as fast as you can, you can't catch me I'm the gingerbread man". It came after pupils at the Stockton-on-Tees school discovered a gingerbread biscuit they made had "escaped". The project aimed to teach the pupils about different regions of the world. Isabelle, aged five, said: "Wow. He must have run a million miles now." Freddie, also five, added: "The gingerbread man went to Disneyland just like me." People from around the globe have been calling the school and sending extra information about their hometowns on the postcards. The project even inspired a school in Poland to try their own version of the gingerbread man challenge. Reception teacher Lisa Worrall organised the project and said she wasn't expecting the "overwhelming" reaction. She said it was a "good way to teach the children about the power of the internet" as people "focus too much on the negative side of it".